19 years! Wow, that's a long time. We have loved, lived and laughed with this film since 1995, a year, when most of the 90s children were tiny tots (I was three) and our parents lovingly took to us to watch this one helluva film, without knowing that it will stay with most of us for life. Yes, we are talking about the much loved - Dilwale Dulhania Le Jayenge. Rarely do films create such an impact, that their dialogues go on to become an integral part of our lives. C'mon, I am quite sure most of us would have said "Palat" or "Ja Simran Jaa, jee le apni zindagi" in between casual conversations (or best, to pull someone's leg). And what do I say about the legendary Maratha Mandir? 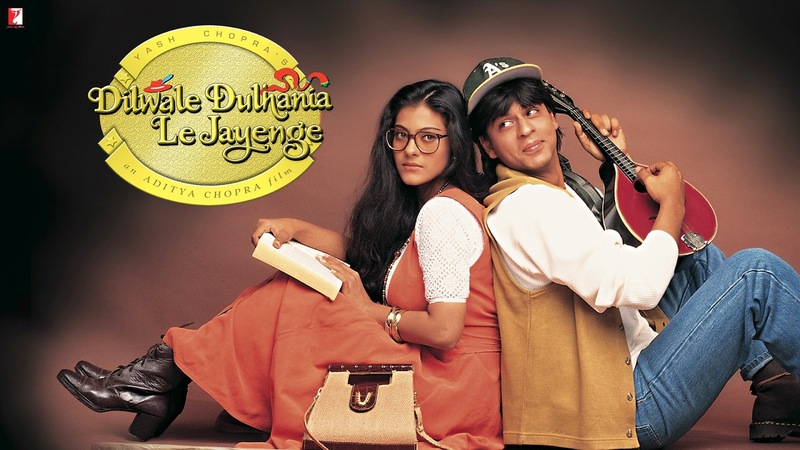 The place has become a temple for most DDLJ fans, who hang around to buy tickets and make their mornings special with this romantic saga, which happens to be Aditya Chopra's directorial debut. It may just be a film for some, a romantic bible for a few others, but for those who have seen it umpteen number of times (and add to that, woke up early to catch the matinee show at Maratha Mandir), it is much more than just a film. It is a gift that they will cherish for several years to come. Well, that just explains the reason why even after 19 long years, the film continues to see a decent turn out, everyday, at Maratha Mandir, and has completed a legen (wait for it) dary 1000 week run. On this special occasion, we list some of our favourite moments from the film. Because after all, aise badi badi filmein roz nahin banti, Senorita! The reason why most girls born in the 90s had their first crush on King Khan. Admit it, we have have all tried to act all girly in the rain, while singing "Kaisa hain kaun hain, woh jaane kahan hain," and post shower, tried these towel dance moves A la Kajol. That moment when everyone in the cinema hall goes 'Aww', including me, you and every other DDLJ fan out there! We all love Raj, and we can't stop laughing when he breaks the"Kal raat" waali news to Simran. But seconds into the scene and again, we all go - Awww! And you be like - Say whaa? Isn't Raj just plain crazy? The song that made every individual hunt for that perfect patch of Sarson ke khet, only for them to run the Bollywood way and sing "Aankhen meri, sapne tere." The song that makes you see your loved one around, successfully since 1995 (and the track that tops my iPod playlist, every single time. My favourite from the DDLJ album). How else will Shahrukh Khan continue to save his lady love and pull her inside the running train, for the next 20 years? On a serious note, this is 'the' moment when Simran is finally allowed to live her life. The moment where the legendary Late Amrish Puri says, "Jaa Simran jaa, jee le apni zindagi." If someone like Raj, with a mandolin in hand and those magical eyes, says Palat, you might as well do as he says. Again, another iconic scene that went on to inspire several folks. Another one on the 'Aww' list. Aap convince ho gaye, ya main aur bolun? In case you are not up to anything important today, just sit back with your favorite food, a tall glass of juice and enjoy this epic, romantic tale of Raj and Simran. A tale of true love, happiness, values, tradition and more. Thank you Shahrukh Khan, Kajol, Aditya Chopra and above all, the Late Yash Chopra for asking us to 'Come, fall in love'. Not just with the film, but with its ensemble cast, moments, dialogues songs and of course - Raj and Simran.